When ‘Manifestipi’ first debuted in 2013 at the confluence of the Red and Assiniboine rivers in Winnipeg, Manitoba, co-creator Kevin Lee Burton (Swampy Cree) recounted the “beautiful” moment an inquisitive woman ventured onto the site of the outdoor art installation. Curious about the artwork’s bright lights and intriguing audio, she evidently made her husband turn their car around. Burton explained to her that the lone plastic tipi that had piqued her interest, illuminated by lasers where it stood on the public green, was a modern nod to the ancient history of the site where they now stood in conversation. “We started talking about how the art was a comment on the place, how it was a sacred spot and a place where trade and meeting between people had happened over 6,000 years,” Burton says. The hope that the artwork would spur similar discussions is the inspiration behind “Manifestipi,” now on view through March 25 at the Smithsonian’s National Museum of the American Indian, George Gustav Heye Center in New York. Ironically the composition initially robs its viewers of speech. 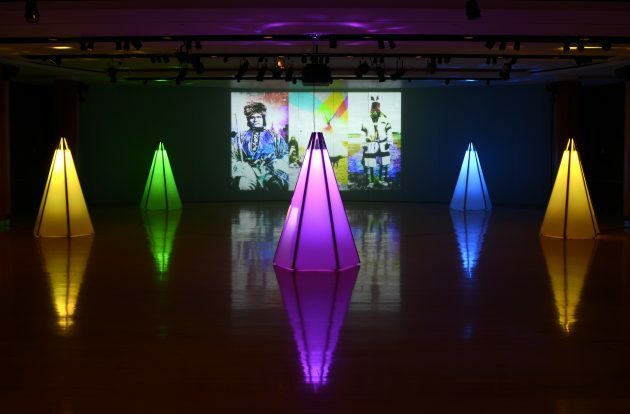 Composed of a circle of five sleek acrylic tipis, the structures glow from within in shifting candy colors. A slideshow of historic First Nations images cycles on a wall behind the tipis, each frame slashed through with colors that link them to the tipis. A soundscape of intermingled natural and urban sounds infuses the entire setting: water lapping against stones, a crunch of gravel underfoot, the squeal of a train’s metal wheels on a metal rail, and birdsong. Created by the ITWÉ Collective, a trio of First Nations artists including Burton and fellow Canadians Sébastien Aubin (Cree/Métis) and Caroline Monnet (Anishnabe/French), every element of the composition hearkens back to that gathering space at the Forks, as the confluence of Winnipeg’s two rivers is known. 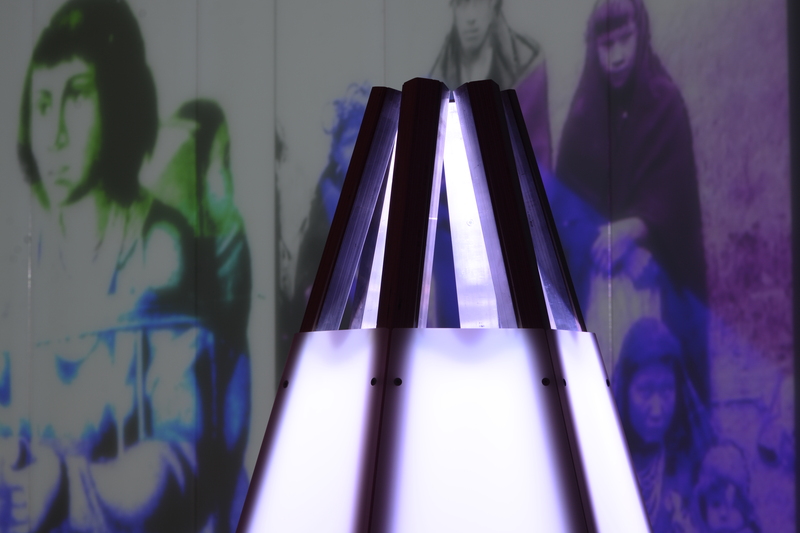 The archival images are all of people and traders who inhabited the area in the recent past; all of the audio was collected at the Forks by guest collaborator Michel Germain. 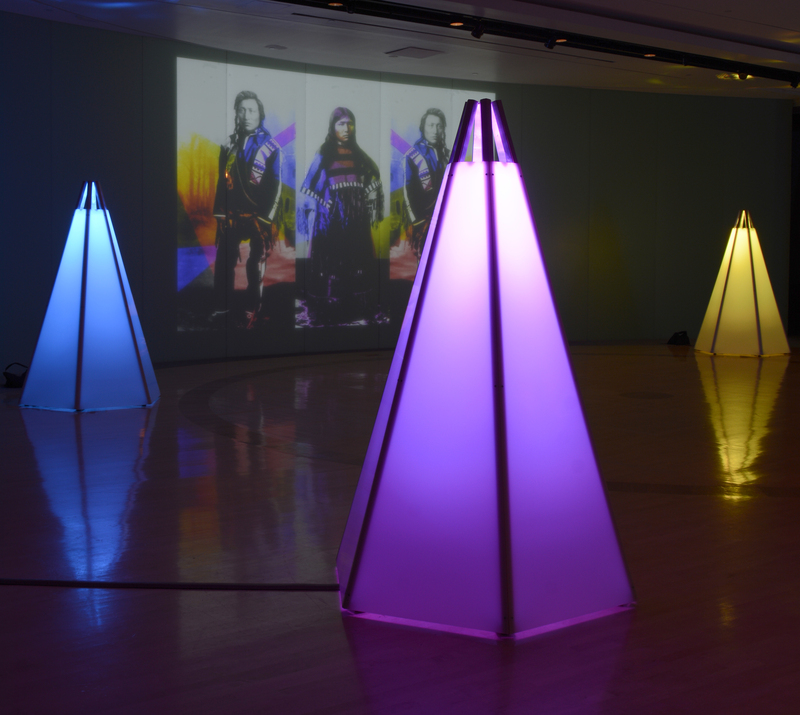 Though the shapes and images are iconic and traditional, rendering them with modern colors, materials and sounds asks viewers to think about the persistence of a distinct indigenous influence and culture in the modern world. This means leaving plenty of room for expressions of every kind. The caveat ‘Manifestipi’ adds is that those expressions lead to conversations and genuine questions, not arguments and confrontation—even if the conversations have the potential to be awkward, as between Burton and his questioner in 2013. “The work draws on the tradition of tipis and other structures that are meant to draw people together,” says Kathleen Ash-Milby, co-curator of the exhibit along with David Garneau at the University of Regina in Saskatchewan. The short duration of the installation was planned to coincide with work to be done to the Heye Center pavilion where “Manifestipi” will reside through the end of March. Its presence fits well with the concepts explored by the works on display in the larger, longer “Transformer” exhibition in the museum’s upper galleries. “Many of the works in “Transformer” deal with the idea of movement, things being temporary and in motion,” Ash-Milby says. “I think it’s stunning. Reimagining those symbols in such a modern way is brilliant,” says New York resident Corinne Monson, who was excited to see the exhibit during its opening days in early February. 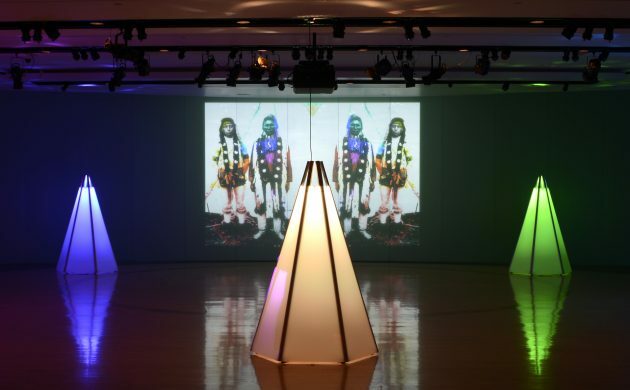 Ash-Milby says those reactions are what she hopes visitors to both “Manifestipi” and “Transformer” take away from their experience: that although many of the forms, figures, and inspirations may seem old and entrenched, technology infuses them with new ideas and meaning. “We want people to be surprised by what Indigenous art can be,” she says. “It can be exciting and illuminating and use technology in a way you might not have considered.